Not just a novelty, this pointy white beetroot is great - no more red stains all over the kitchen. The flavour is just as normal. 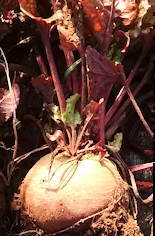 It is also the most productive and quick-growing beetroot we have found. Although white beetroot have been known since at least Roman times, this is an improved modern variety for home gardens, and dual-purpose - the succulent green leaves have been bred for use as leaf beet or chard. We often pick the beet in the morning, cook the leaves at lunch, & eat the root for dinner. The name means "Bloody". If you do want a good traditional, deep blood-red beetroot, this is the one. Large conical roots, with intense red flesh, very juicy and sweet. This special strain from Italy is the most productive red beetroot we have found. Tender even when huge - lots of people have written in to say how much they like it. Very large conical roots. Tender, no woodiness. Deep red. We really love this variety. 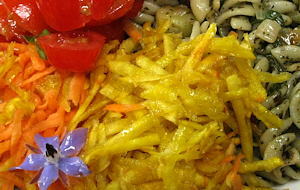 Yellow beets used to be widely grown, but many of the the good old garden strains are no longer well maintained. However, after much searching we finally found this excellent and very beautiful beetroot! Touchstone Gold has been rebred from old seed stocks by our friends at Wild Garden Seeds, and they have done a great job - coming up with a really vigorous, quick-growing yellow beet that makes round, bright yellow roots. It is tender and very sweet. 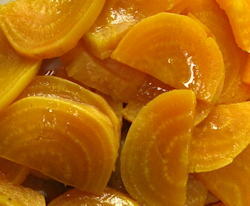 Beautiful & very productive yellow beetroot. Edible leaves. In 2014 Tom Hartley brought us back lots of seeds from Kazakhstan, including several beetroot, and we grew them all out to see what they were like. We did a blind taste-test, trying them all unlabelled, and this one came out as the best every time. It was then a two-year project to bulk it up and produce seed; we grow it, harvest the beet, check for the right size and shape, replant the good ones and then they make seed the following spring. Here it is then for you to try; our favourite of all the beetroot varieties Tom brought back - a good deep flavour, medium sweet flesh, and a consistent shape with sturdy growth. Tasty rare beet from Kazakhstan. Just a few hundred packets available each year. 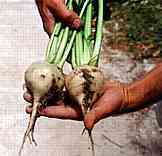 Beetroot seed is fairly easy, provided you don't have any chard or leaf beet flowering nearby. Make sure you choose ones that are true-to-type: right colour, shape & size. If your area has cold winters, store them in sand or sawdust in a cool but frost-free place, and plant out in spring. (the ideal storage is about 5-10 C and 95% humidity). Otherwise in milder areas, replant them straight away where you want them to grow. You can plant them outside, but you will get much more seed if you plant them in a polytunel. The next summer they will flower (to about 5 foot high!). They will probably need staking so that they don't fall over. 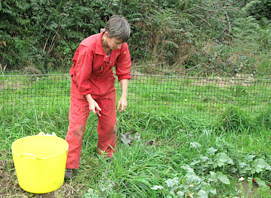 Remember, that they will cross with any other flowering beetroots, chard or leaf beet nearby. The flowers are wind pollinated. Your seed will be ready in late summer. Just rub the seed off when it is mostly brown. 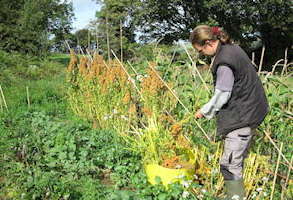 You will get huge amounts of seed: dry it well, and it will be good for 3 or more years. Above you can see a good trick with beetroot or chard seed. Our rubber door mat has holes in it. We just stomp on the dry seed-stalks , then roll back the mat and sweep up the seed. To clean the seed free from dust and debris, see our Winnowing Instructions in the Seedsaving table on the left.